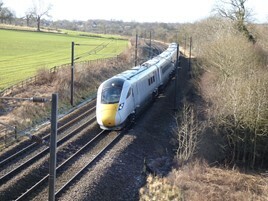 Main line testing of the first Class 801 has begun in the UK, after five-car 801101 ran from Doncaster Carr to Darlington and back late on January 29. It is the first Hitachi Intercity Express Programme electric multiple unit (EMU) to travel on Network Rail metals, and one of three ‘801s’ in the UK. Fellow five-car 801102 is also at Doncaster, while nine-car 801201 is now at Doncaster Carr, having moved south from Newton Aycliffe last wee. The latter has undergone various tests within the factory, as well as trips on the short test track at the site. Virgin Trains East Coast (VTEC) plans to introduce the first Azumas into traffic in November (RAIL 845). It is understood they will run to Leeds and York. A RAIL source suggests that subject to final plans being confirmed by VTEC, one set will enter traffic in December, with a further three sets entering service during January 2019, again serving Yorkshire. The North East receives its first Azuma trains in February 2019, when a further three trains enter traffic (taking the number to seven). The first Scottish trains operated by Azumas will begin in March, when a further three sets are in traffic (taking the number to ten). The Department for Transport has ordered 42 Class 801s for VTEC, with 12 five-car (801101-801112) and 30 nine-car sets (801201-801230) to replace the existing High Speed Train and Class 91/Mk 4 sets. A further 13 nine-car Class 800/1 (800101-800113) and ten five-car Class 800/2 (800201-800210) bi-modes are also on order, with 800101 in the UK since 2016 and used for testing across the UK. For the full story, read RAIL 846, on sale now, and available digitally on iPad and Android. Plus 24 5-Car Class 802/3’s Bi-Mode have also been ordered with 19 802/3’s for Transpennine Express and 5 802/3’s for Hull Trains. That's if VTEC even last. Myself I want the franchise to end, go back into government hands and be rebranded LNER with a GWR/Gatwick Express style livery.